First things first… Happy Thanksgiving to one and all on this beautiful morning. Well its beautiful here in Georgia, just really cold. I’m thankful for so many things as I sit sipping my coffee and getting ready to start preparation for all the food I need to prepare. I’m thankful for my family that stands by me no matter how crazy I get, for my friends that stay faithful even through my writing frenzy and most of all I’m thankful for my Savior that saved me and keeps me in line. What are all of you thankful for today? 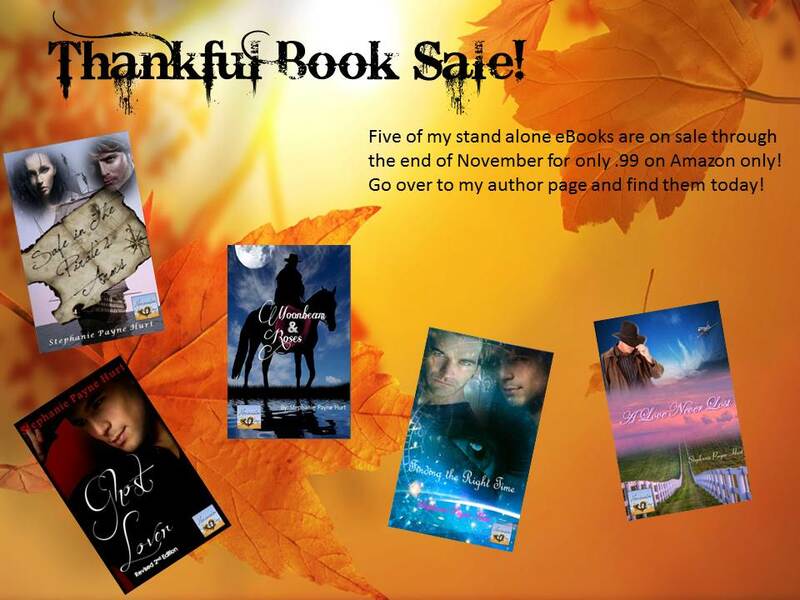 As I do every Thanksgiving, I’m offering 5 of my stand alone books for only .99 each on Amazon. I’ve been so blessed in my writing and the friends I’ve gained through it. All of you are wonderful and I wanted to offer a deal for the season. As always great writing and May God Bless You…. Categories: Uncategorized | Tags: Books, family, friends, thanks, Thanksgiving | Permalink. Guess what I did yesterday? No not that, well maybe but it’s not what you think. I created a children’s book. It’s been in my brain for over two years and I decided to try out KDP’s new Kid’s Book Creator. My cover designer and I sat down with powerpoint and created each page.OF course she looked at me a little strangely when I said, I have an new idea. It always scares her when I say that. She usually asks when I’ll stop trying new things and I figure that will be when I’m gone. I made it easy because I’d already written the wording so it was just the point of creating the pages to go with the wording and I have to say it’s harder than you would think. I have another children’s book in the work, but this one is for a little older age group. It’s a little more book form than picture book form. As a children’s minister I hear so much out of children. Some weeks I just sit and laugh at what comes out of their little minds and mouths. Parent’s beware, your children spill the beans often, but innocently. I know more about the parents lives and mishaps than anyone. It’s so funny and so much fun. But I do keep it all bottled up in my overactive brain. Maybe I’ll bring it out when I need extra help one day, never know. As for the children’s book area of my brain, yep I went there. A couple of people have wondered when I’d venture to that area, especially since I work with children. Since I’m a big kid at heart it’s not too hard to slip into their mindset. Some days I feel like I’m just a bigger version of them. Some days my friends and family say I act like them too. Not sure if that’s good or bad. LOL! So, if you get a chance go over and check out my first attempt at a children’s book. Now I have to warn you, this is our first attempt at Horseshoe Publishing so don’t be too critical.I can say it was extremely fun! Categories: Uncategorized | Tags: Angels, Authors, Children's Books, Christmas, Christmas Children's Books, Writing | Permalink. Monday mornings are tough, but when you wake up to the sound of rain on the roof, well, it just sets the mood for the day. Of course here in Georgia it’s cold and rainy. The temps are hitting a high at lunchtime and then going down from there. So it’s turning out to be a dreary, cold, sweater wearing day. Right now I’m curled up on the couch, sipping coffee, watching the Today Show and catching up on my posts. This is what I call my special time of the day. My son is at school, hubby is at work and I have about two hours before I need to get ready to walk across to my office. This is also my writing time. This morning I’m working on Ridge. I know, I’ve been talking about this book for several weeks, but I’m excited about this book, well actually the whole series. Of course you know I love a cowboy romance and this will turn into five. Each main character is special and has so many facets of their personalities. Someone asked the other day if I have anything else in the works, along with the Five Oaks Ranch. I have to say that a book came into my mind about two weeks ago. I’m playing with an outline, but mostly working on Ridge. As you know me, I do have several books on the back burner. Funny how you get into a story and then something happens and your attention spans steers off in another direction. What are you doing this morning? Is the weather good in your area? Categories: Uncategorized | Tags: Authors, coffee, Cold Weather, Monday Morning, Outlines, Posts, Raining, Today Show, Writing | Permalink. Good morning all! It’s really cold here in Georgia. I’m sitting by the fire with my second cup of coffee and checking my posts. I love this time when I’ve got a little time to write posts, post on sites and work on my writing. 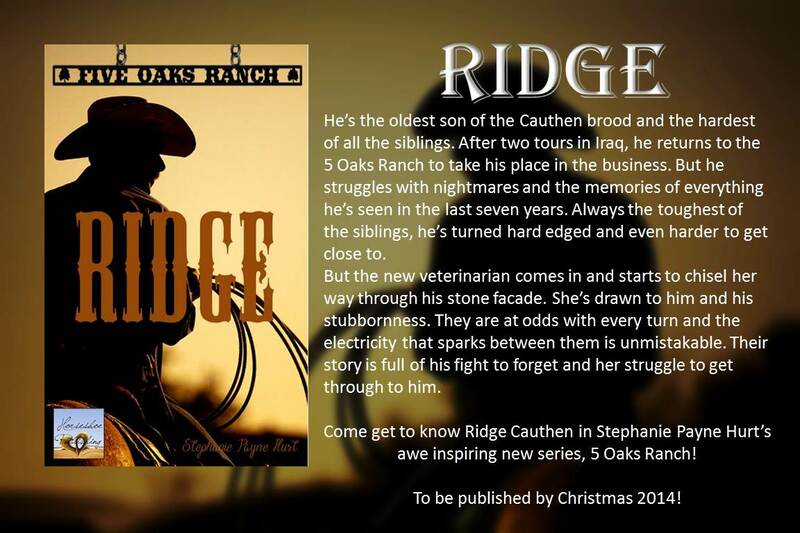 Today I’m working on Ridge, which is the first installment of the 5 Oaks Ranch series. I can’t help but smile as I write each part. As you know me well, I’ve got the outline completed and know basically where the story is headed. Some days I’m so excited that I go ahead of myself. No actually I do. If a certain part is calling out to me, I’ll create a separate word document and get it down. When I actually get to that part, just copy and paste. It helps keep the overcrowding of my brain from completely taking over. Ridge is a special character to me. He’s got this rough edge that just makes him pure cowboy. The time he spent in Iraq during his two tours of duty have given him a edge that will cut the most unwilling intruder into his world. His only soft spot is his little sister Maggie. The smile she gives him makes some of the stone around his heart chisel away. But the fun part starts the minute he meets Mallory, the new ranch vet. Their sparring will keep you wondering where it’s headed. The fun part is how Ridge avoids things that are unavoidable. Can she break the ice that’s totally Ridge? For the next couple of weeks I’ll be working on his story. If everything goes well you’ll be able to meet Ridge before New Year’s but let’s just see how it goes. Categories: Uncategorized | Tags: Authors, Avon Romance, avonromance.com, cowboy romance, Cowboys, Love Stories, New Year's Eve, Ranch, Ranch Romance, Romance, series, Stephanie Payne Hurt, Writers, Writing | Permalink. Some of you may not know this, but I’m a ‘if it’s not broken, don’t fix it’ type person. Even when upgrades are needed or maybe new equipment, I keep purring along with what I’m currently comfortable with. I guess it goes along with my introvert ways or maybe it’s just that I’m in my own little world and happy there. Not sure, but I’ve stepped out of my comfort zone and well, I kind of like it. If you’re wondering what I’m blabbering about, well I finally upgraded to an iPhone this past week. You’re probably still tapping your head and saying ‘really’, but it’s just me. I was happy with my old phone and it was happy with me. But when I’d pull it out of my pocket or purse it would fall apart, so my hubby snatched my phone and upgraded me. It was like being separated from the womb, but I’m coping. As a very busy accountant, writer and children’s minister I was afraid of learning something new that would take time away from all of that, but it’s gone well. After five days with the new fancy device, I’ve all but mastered ordering apps. I decided last night to grab the Instagram App. My son almost had a stroke. He was a little concerned about mama checking on him in his private world, but he got over it. As I sat yesterday waiting on hubby to pump gas into the truck an idea for a new book came across my brain. If you’re a writer you know how critical it is to get that idea down on paper. Well, as I reached into my purse, I noticed my handy dandy notepad was not present and in a panic I looked around the truck for anything, even a napkin to write it down. Then I remembered the note app on my new phone. Smiling I quickly opened it and voila my idea was stored for future use. Now that’s a plus for the new phone. Not to mention I now have my Kindle on there too. So, do you have areas of your life that are behind in the times? Categories: Uncategorized | Tags: accounting, Apple, Apps, Author, Books, Concern, Coping, Instagram, Kindle, Life, Phones, Writing | Permalink.